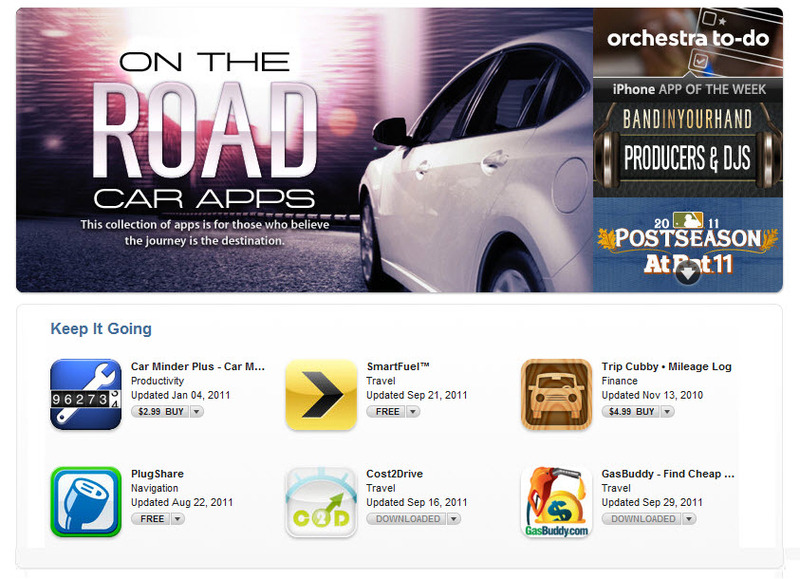 Cost2Drive iPhone App Featured in iTunes! The big news keeps rolling in for our new Cost2Drive iPhone app as this weekend we learned the app has been featured in a special ‘On the Road’ section of iTunes for car apps. The Cost2Drive iPhone app, which calculates driving costs and compares it with flying, has been receiving a steady stream of great reviews and press attention since we launched it over Labor Day weekend and has quickly become a Top 20 app in the Travel category in the App Store. We’re extremely excited by the great interest we’ve had in the Cost2Drive iPhone app both from consumers and the media and are looking forward to making it even more of a must-have app for car travelers across the globe so stay tuned for even more exciting news from C2G on this front. Meanwhile check out the new app in iTunes and let us know what you think! 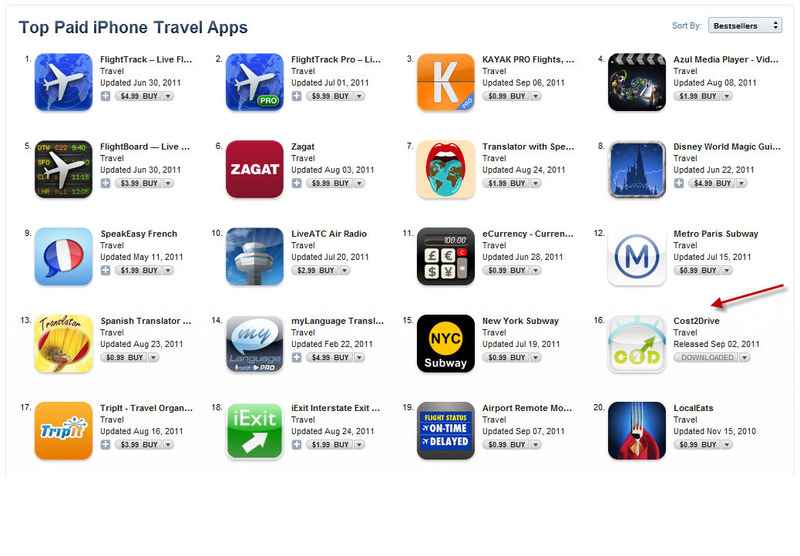 UPDATE: The new Cost2Drive iPhone app was just names App of the Week by Love For Tech tech blog! Read the review. Only 2 weeks after launching the revolutionary Cost2Drive iPhone app it’s already getting some great reviews from such prominent brands as Autoblog and CBS Radio which helped catapult the app quickly into a Top 20 ranking in iTunes. WOOHOO! But we’re not resting on our laurels, and so today we’re excited to announce we’ve made the Cost2Drive iPhone app even better by introducing a drive vs. fly cost comparison feature. With this recent update when you enter a route that’s over 200 miles in distance you’ll now see the cheapest airfare for that route as found on the leading airfare search Website Kayak.com. When we first introduced this market-leading innovation on our flagship Website our users immediately embraced it, and so we’re delighted to now have it fully integrated into the iPhone application so users can quickly see if its cheaper to fly or drive to their destination. Download the the new app today in iTunes at our low introductory price of $1.99 and let us know what you think of this exciting new feature! 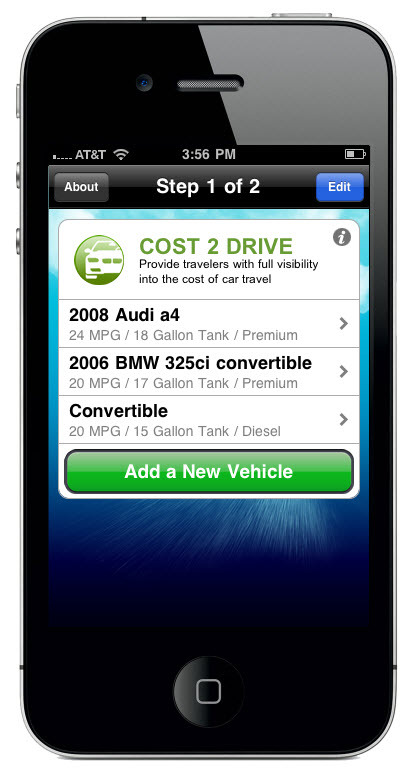 C2G Launches Cost2Drive iPhone App! Revolutionary App Makes Calculating Driving Costs a Breeze! UPDATE: We’ve just launched version 1.0.1 which has an airfare comparison feature. Read more here. Ever try to figure out how much it costs to drive somewhere? It’s easy, right? Just multiply the distance by the price of gas. Wait, you also have to factor in the fuel efficiency (MPG) of the car you are driving. Hmmm, and gas prices where you live be very different from where you’ll have to refuel during your trip. Maybe this isn’t as easy as you first thought. That’s why we created Cost2Drive, to help you quickly determine the cost of driving places, and why today we’re VERY excited to announce that right on the eve of Labor Day Weekend we’ve launched an iPhone version of our popular Web application that makes it even easier to calculate trip costs, and that it’s now available for download here in the App Store at a special introductory price of only $1.99. 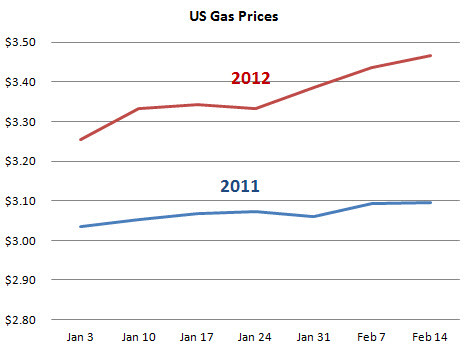 With gas prices remaining stubbornly high, driving costs can quickly diminish a household budget. For a family planning a trip from New York to Disney World in Orlando it can cost over $400 in fuel driving a typical SUV, and if you haven’t factored these costs into your vacation budget it can be quite a shock at the end of the month when the credit card bill arrives. Whether you’re planning a family vacation, a college road trip or just want to see if its worthwhile to drive to the next town to get a great deal, the Cost2Drive iPhone app makes it super easy to quickly determine the cost of the trip. One of the most unique features of the Cost2Drive iPhone app is its ability to factor in different prices for gas as you travel along a route. 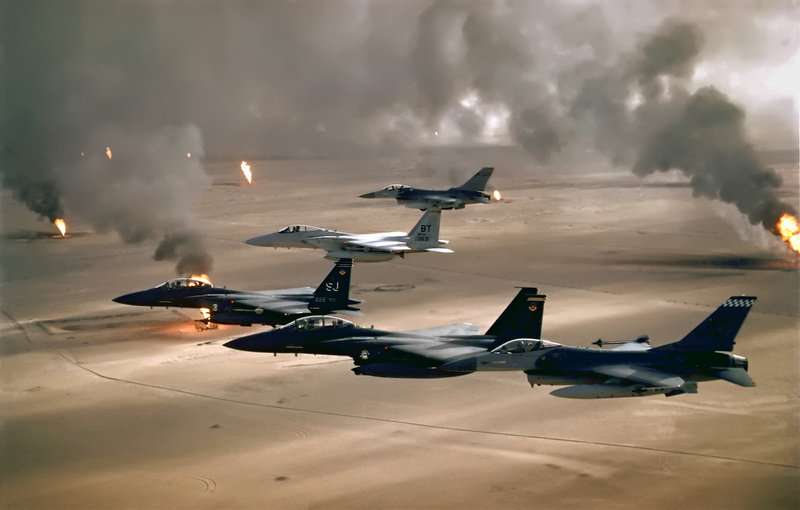 Gas prices can vary tremendously from state to state, or even city to city and so our app takes that into account by pulling current gas prices from refueling points along the way. We determine these points based on the driving range of your car (how far it will travel on a single tank of gas), information that we’ve painstakingly collected on over 20,000 cars and light trucks in the US. Although no app can be 100% accurate in estimating fuel costs, many users of Cost2Drive.com have told us that our Galculator (the technology that powers both the Website and iPhone app) has been accurate to within $1 for trips over a thousand miles in distance. 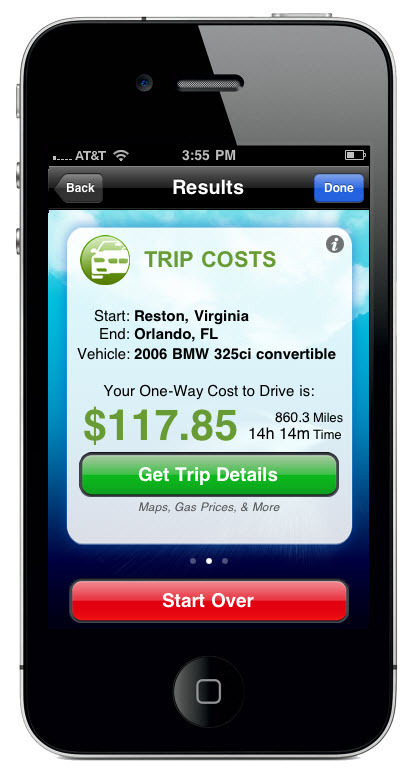 The Cost2Drive iPhone app leverages many of the unique capabilities of the iPhone to make it even easier to calculate trip costs. For example, the app utilizes the iPhone’s location services to automatically fill in your current location as the starting point of your route (this can easily be modified by the user). The new app also enables you to auto-fill the address of a friend from your iPhone address book, so you can see what it costs to visit family and friends with the tap of a button. The Cost2Drive iPhone app also lets you store up to 5 vehicles in the app, and you can easily compare the cost of driving these different vehicles with a simple swipe of your finger. 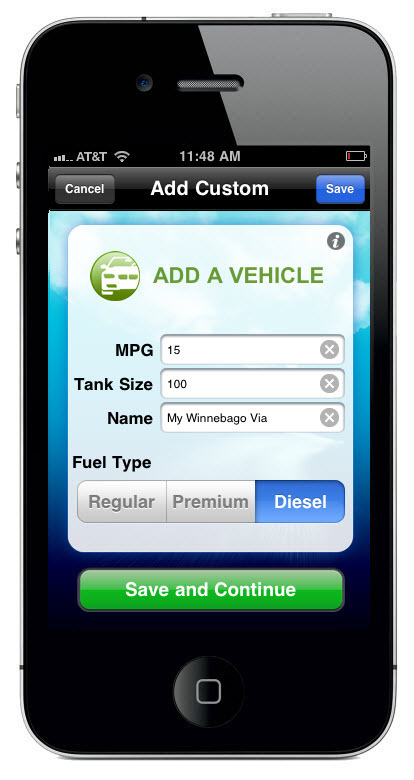 The Cost2Drive iPhone app also provides you with the ability to manually enter and save vehicles and choose from 3 grades of fuel (regular, premium and diesel). This means that owners of vehicles that aren’t yet included on the app (i.e., RVs, motorcycles, U-Haul trucks) can also take advantage of this great app to plan trips. Just as with the Cost2Drive Website, you’ll be able to view maps displaying your route and where you’ll need to refuel along the way, and the app also helps you save money by finding the cheapest gas at these refueling points from over 100,000 gas stations in the US (provided by OPIS). 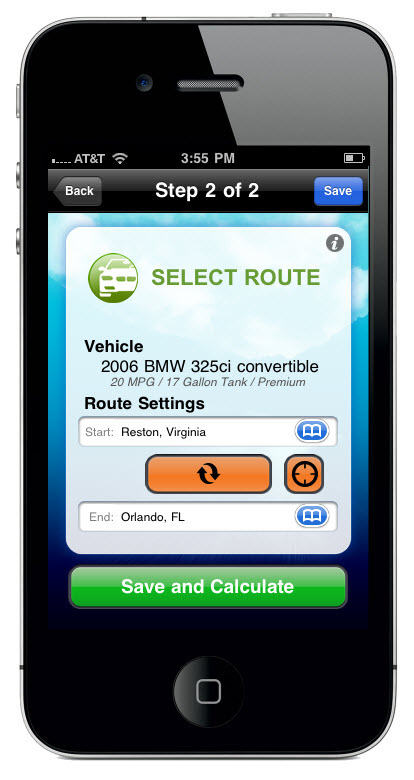 The map and fuel prices are presented in the iPhone’s Web browser via a new redesigned version of Cost2Drive.com. We’ll share more on that in a future post, but for now purchasers of the iPhone app will enjoy this special sneak preview of some great new enhancements we’re making to the Cost2Drive Website to better serve your trip planning needs. Don’t wait to purchase your version of the Cost2Drive iPhone app as this introductory pricing will only be available for a limited time. Download the app today and let us know what you think! Apple, iPad, iPhone and iPod touch are registered trademarks of Apple Inc., registered in the U.S. and other countries. The App Store is a service mark of Apple Inc.